Hong Kong’s air quality is notoriously bad. It deteriorated in the late 1990s as road traffic increased, huge infrastructure works were undertaken across the territory, and southern China developed at full speed. The HK Government twisted itself in knots as it ducked the hard work of tackling the pollution it could control, blamed China, and then realised who they’d just blamed. The air quality index was considered a joke by the press, official monitoring took place on top of skyscrapers (where the quality was bad enough for the government to issue warnings with increasing frequency), while the public choked on filthy air at street level. Cholera and Yellow Fever were not unusual in the summer months. A regular feature of the summer news was the water tankers supplying the fish restaurants in downtown HK (where Chinese custom is to chose live ‘fresh’ fish swimming in a tank) being caught sucking up water from the harbour. 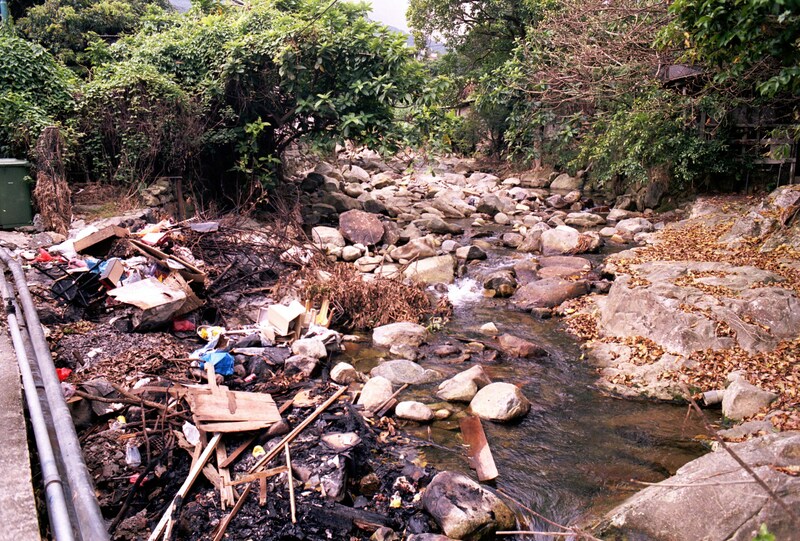 Another Kam Tin river another rubbish tip. 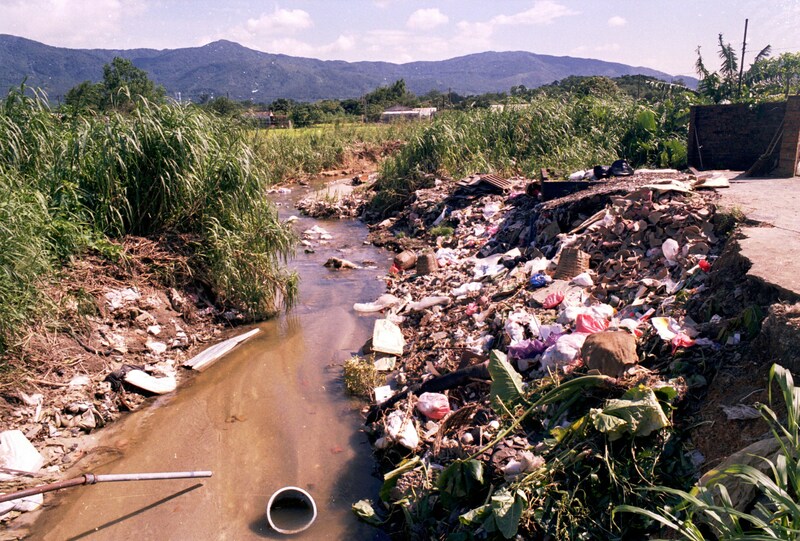 This upland Tai Po river is being used as a garbage incinerator - everything from electronics and batteries to cardboard and furniture. 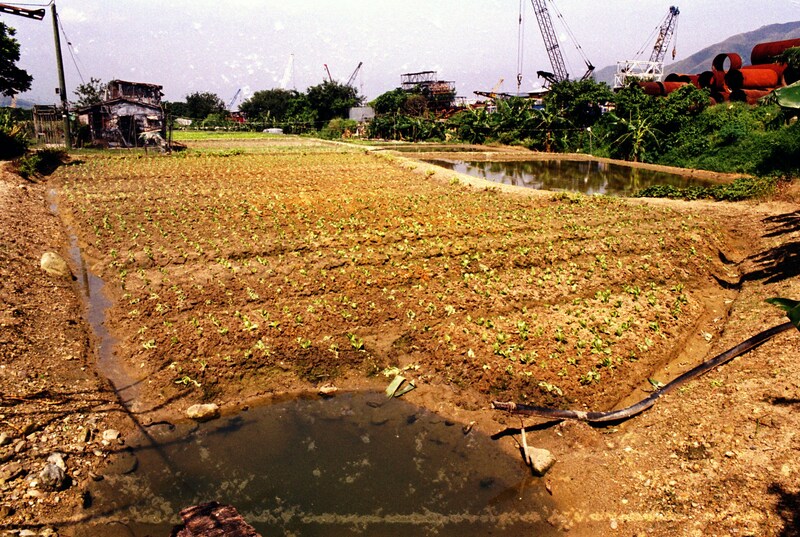 Good enough for this Kam Tin farmer to water his vegetable crop though. It would be easy to blame the farmers for destroying the streams and rivers were it not for 20 years of unrestrained abuse meted out by Neanderthal civil engineers on behalf of the government. As a senior civil engineer admitted to me in the mid-90s, engineers don’t feel they’ve earned their exorbitant fees if they haven’t poured truckloads of concrete on any job. 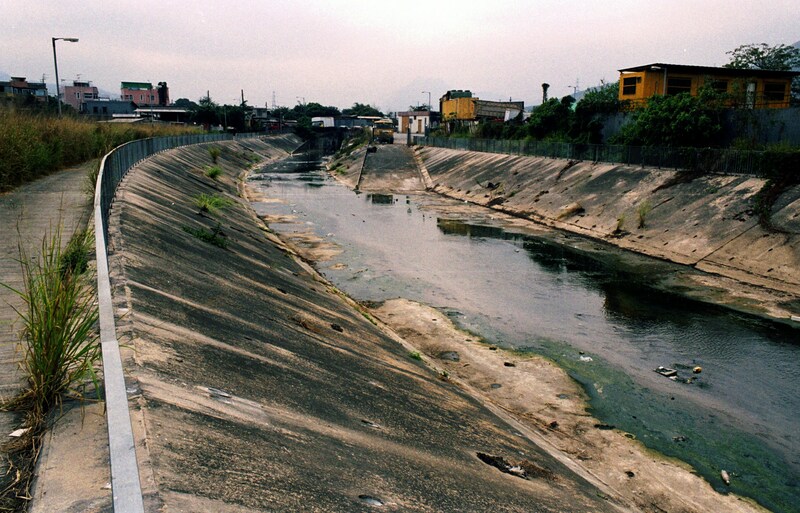 As immigrants arrived from China into the new territories, meandering streams and rivers lost the competition for space, most noticeably in the Yuen Long floodplain. Not quite the meeting of the Blue and White Niles. 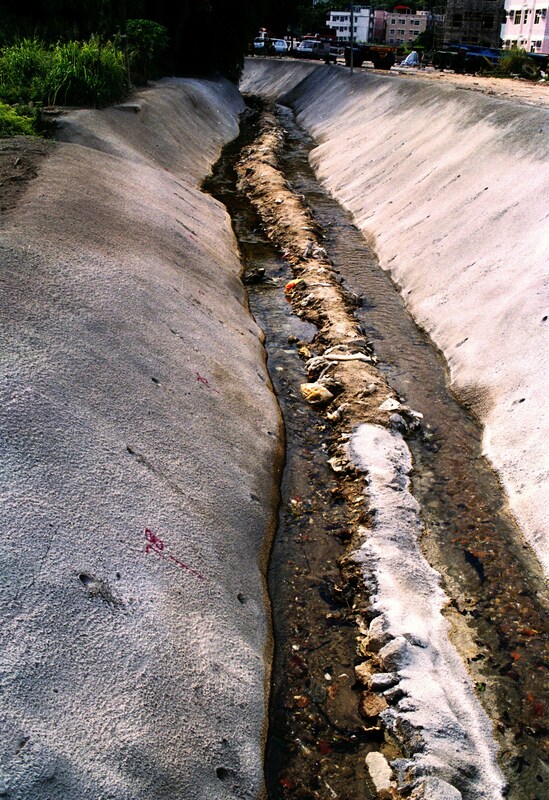 Like those two great rivers though, the pollution in this dead-straight trapezoidal concrete channel refuses to mix. 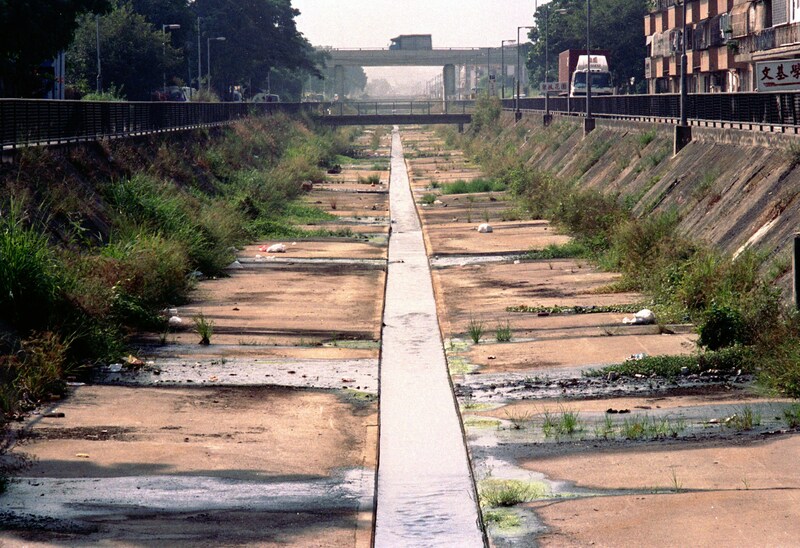 The first designs produced by British drainage engineers (who wouldn't have got away with this in their homeland) produced flat bottomed channels which did not provide self-cleansing and therefore accumulated rubbish and effluent. 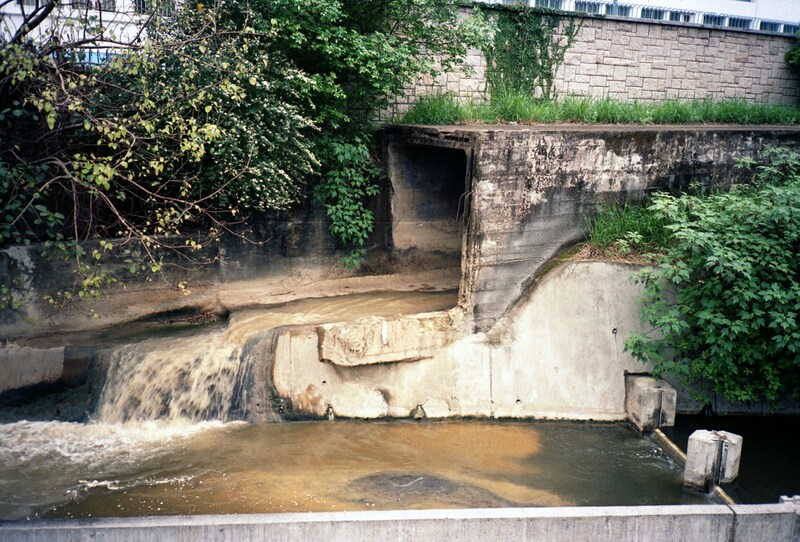 The ramp seen on the opposite bank is for excavator access, to facilitate scraping out. Necessity is the mother of invention. 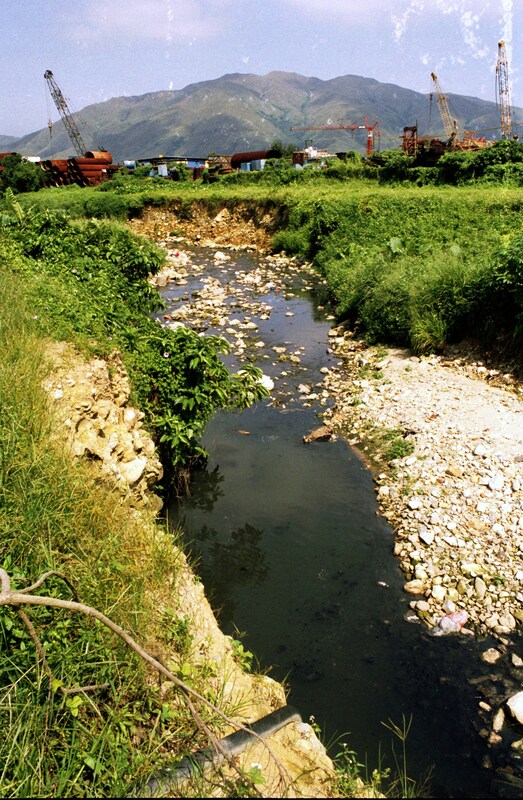 If you don't stop pollution at source, you have to trap it downstream. 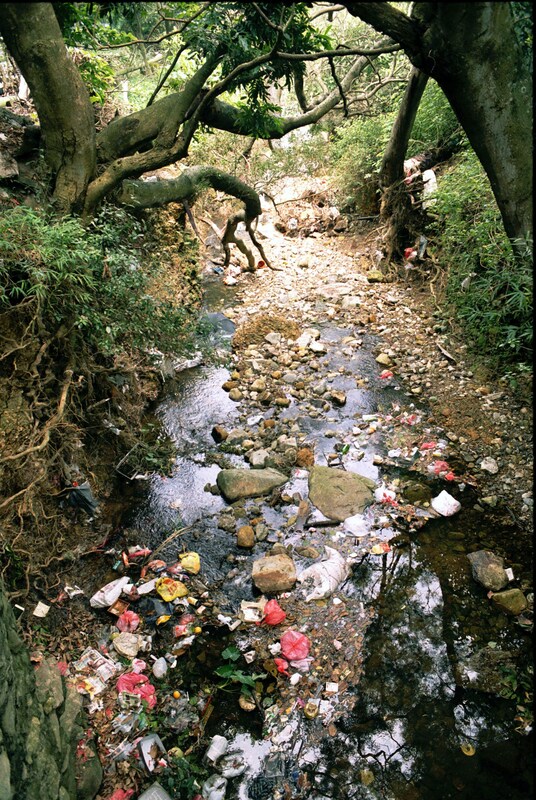 More Yuen Long riverine beauty. Nothing too blatantly obvious here to excite any curious Environmental Protection inspector. 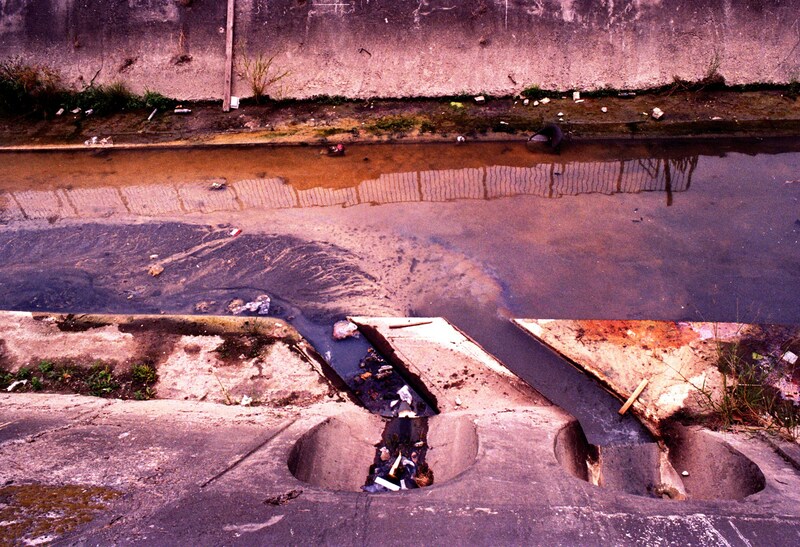 Civil engineers stepped up to the mark and innovated the 'low flow channel' to flush away pig excrement, refuse and unpleasantness. God bless 'em. One man here in Yuen Long was so impressed, he's decided to abstract water from this fester. Drawn onto the map with a ruler and a set square. 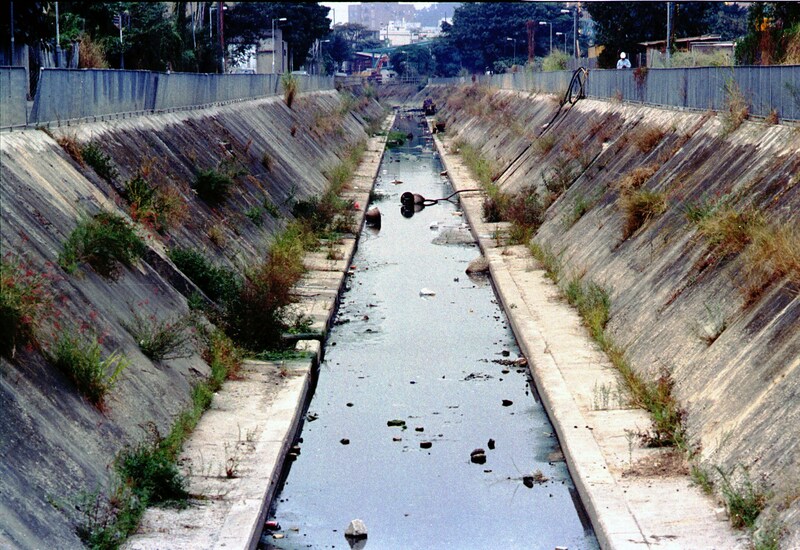 The real hidden beauty of these Yuen Long channels is that they can profitably be lifted straight from page 73 of the Californian concrete channel design manual with very little actual design required. 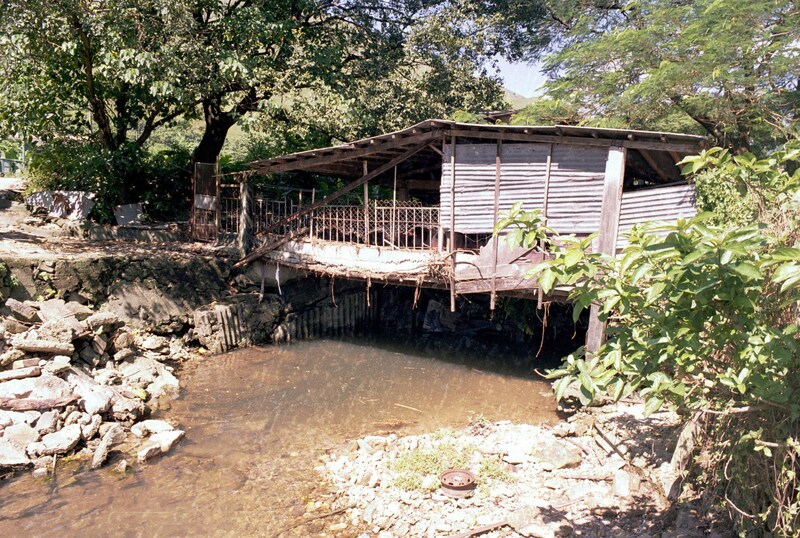 The Kai Tak nullah was mentioned at the top of this page, time then to see this spectacular feat of 19th Century civil engineering from the 1970s. 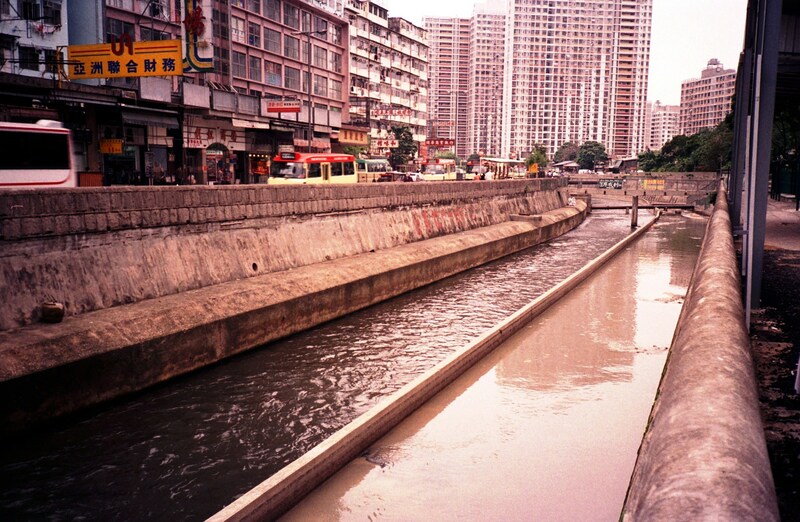 If you don't bother building sewerage and treatment plants, what better option than to pour human effluent into open drains through one of the most crowded cities in the world. 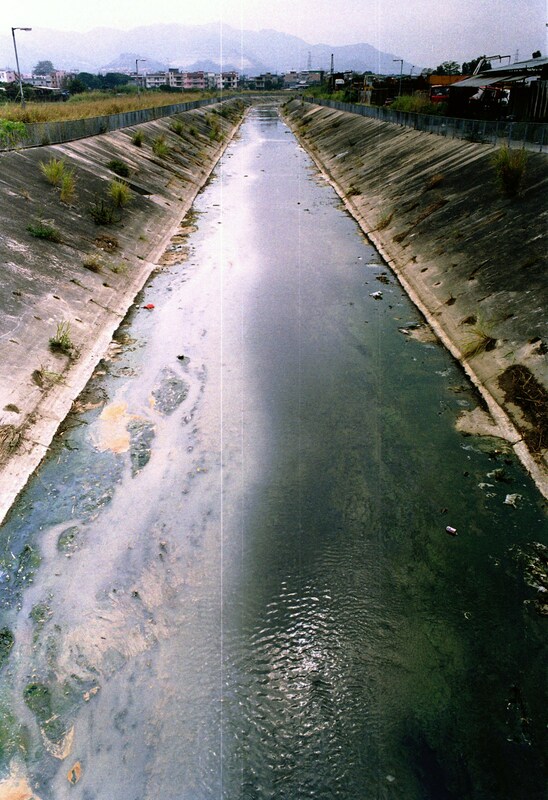 In the left channel we have contaminated stormwater; in the right, human effluent. If only mimicry wasn't the sincerest form of flattery. 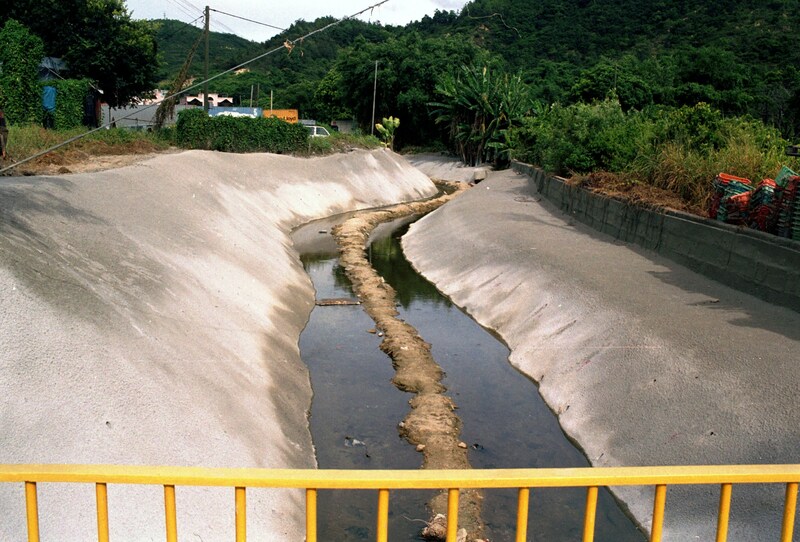 Villagers near Tuen Mun used shotcrete (sprayed concrete) to resolve their own flooding problems. Perhaps they shouldn't have built in a floodplain? Lovely bit of shotcreting, though...If moonscaping is your thing. The HK government uses this method to stabilize dangerous slopes everywhere. 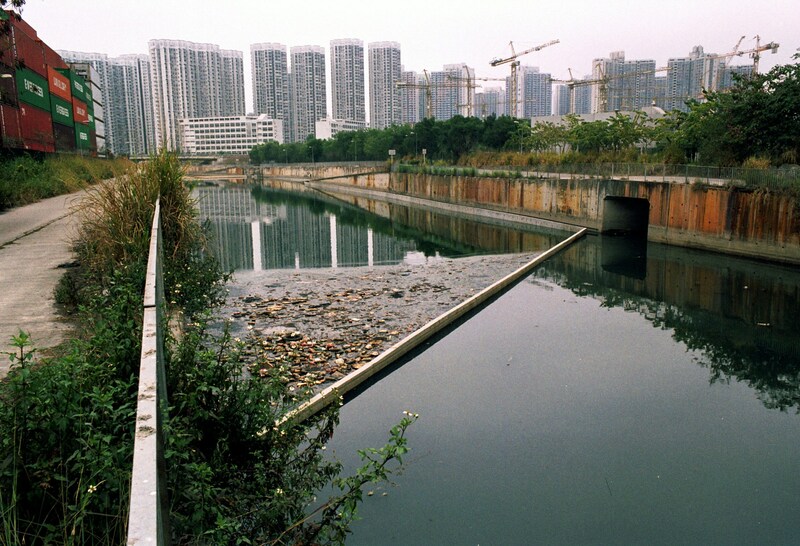 The government introduced Environmental Impact Assessment legislation in 1996. All construction works thereafter were expected to contractually adhere to project specific targets for air and water emissions.